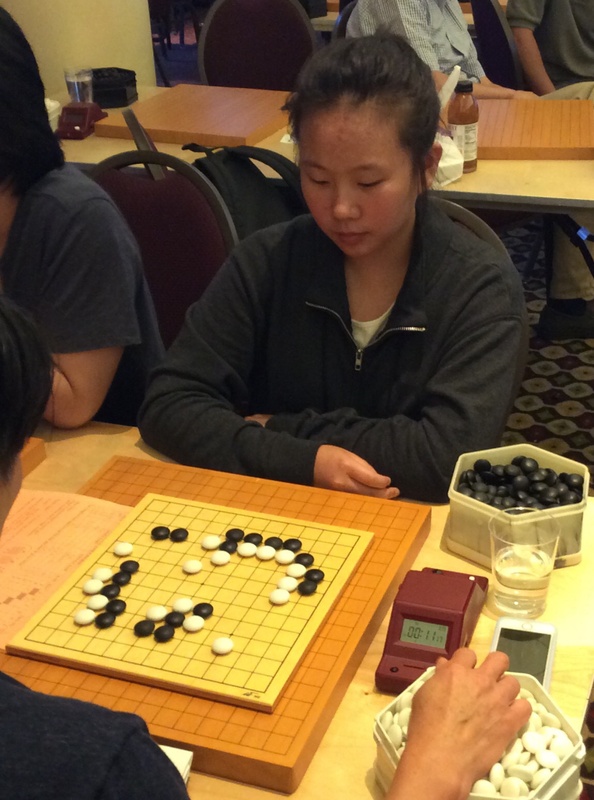 “This tournament is in no way authorized or sanctioned by the American Go Association,” announced Lightning Tournament Director Keith Arnold to the 70 players assembled in the main playing area of the US Go Congress for the popular annual speed go event. 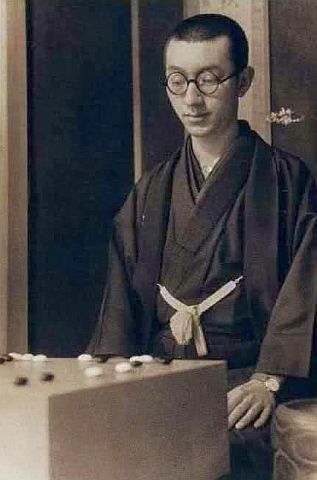 “In fact, the Pro Dinner has been scheduled for tonight specifically so that there’s no chance the professionals will see us play like this.” Arnold explained that while “it’s permissible to try to win on time” — each player has 10 minutes with no overtime — “it’s illegal” to play bogus moves, although he noted that the rule “isn’t enforceable” and that anyone getting too caught up in the rules “is taking this way too seriously!” He rapidly assigned the players into tables of six divided by playing strength and stones proceeded to fly at great speed. 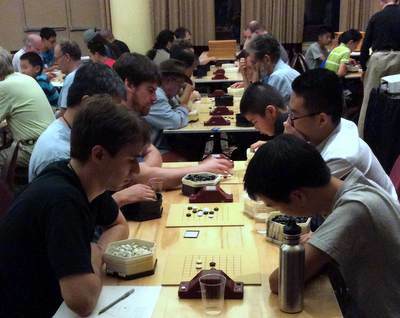 After five rounds in just two hours, 13 players emerged victorious as table winners. Several have already been table champions in the 9×9 and the 13×13. Dan table winners are: Zheng Xiangnan 7D, Xinying Jiang 6D, Will Lockhart 5D, Daniel Liu 5D, Cherry Shen 5D, Amy Wang 3D, and Eric Yang 1D. 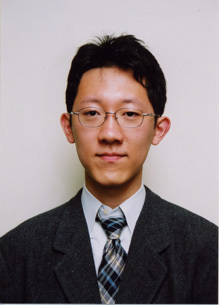 Kyu table winners are: Ben Peng 1k, Yukino Takehara 1k, Jim Fienup 3k, Jeff Wu 5k, Joe Suzuki 7k, Sean Davis 10k, and Kevin Wu 12k. 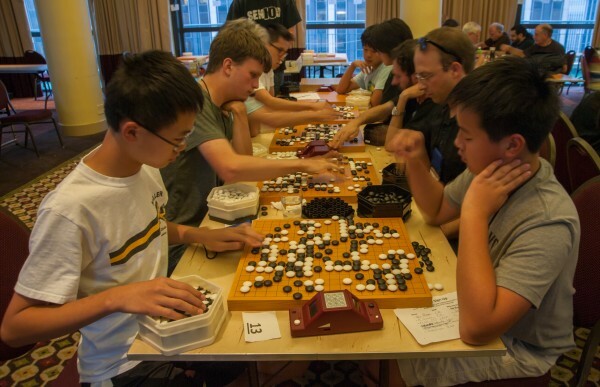 Zheng Xiangnan, Ben Peng, and Jim Fienup are also table winners in the 9×9, and Jeff Wu is also a table winner in the 13×13. - report by Karoline Li; photo by Phil Straus; updated to reflect delayed result entry for table winner Sean Davis 10k. 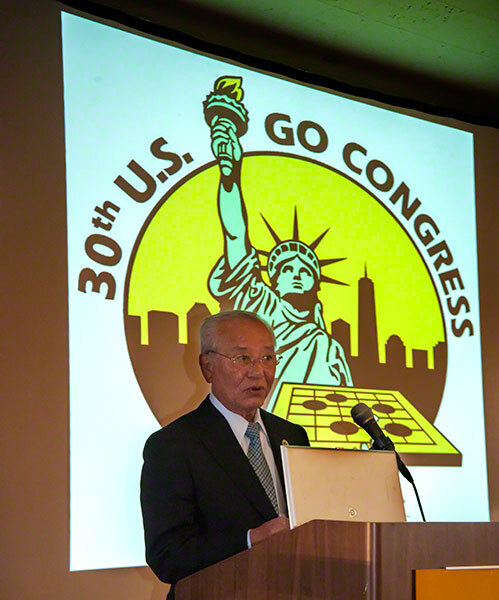 Go is played on big boards, on little boards, and boards in between; last night was the night at the US Go Congress for those who love the 13×13. Directed by veteran 13×13 Tournament Director Jim Hlavka, 40 players split into eight tables by rank, with round-robins at each table yielding eight table winners. Throughout the rest of the week these finalists will play off in a single- elimination series to choose the kyu and dan champions. Winner of their tables and vying for the dan championship are: Gabby Su 5D, Forest Song 5D, April Ye 1D (at right), and Eric Wainwright 1D. 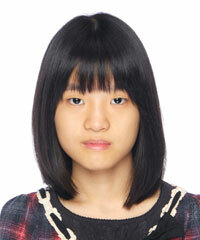 Playing off for the kyu championship are: Anthony Long 4k, Jeff Wu 5k, Ann Wu 10k, and Eric Hookay 13k. The main US Go Congress tournaments got underway Sunday morning as some 260 players started their clocks in the US Open and another 40 players began the Masters Division of the US Open. While the Open is still six rounds played each morning (except Wednesday), the Masters Division is a 9-round event, with an additional three rounds being played Sunday, Tuesday and Friday nights. This new format replaces the 4-round North American Masters Tournament (NAMT) and the 4-round Strong Players Open. 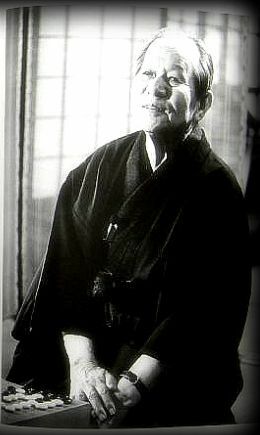 Eligibility in the Masters Division is limited to professionals, 7 Dan or stronger players and NAMT qualifiers. Prizes total over $11,000, including $5,000 to the first-place winner and additional prizes to the top three NAMT scorers within the Masters Division. Click here for the Masters Division crossgrid, which includes results available through Sunday night’s second round. The E-Journal broadcast top-board games live on KGS and those game records are available on the crossgrid as well. Jennie Shen 2P also did two audio game commentaries with EJ Managing Editor Chris Garlock on KGS and those are available free on KGS Plus; look under “Recent Lectures” under USGO5; the 8/10 11:04a game is the AGA City League game between Simon Yu (Seattle) and Bill Lin (Vancouver) and the 11:26a game is the Masters Division Round 1 game between Matthew Hu and Qiyun Zhu. Monday’s live broadcasts start around 9a EST on KGS; the pro game commentaries are scheduled to begin around 10a on KGS. Keep up with breaking news at the 2014 US Go Congress by following us on Twitter @theaga and Facebook at American Go Association. 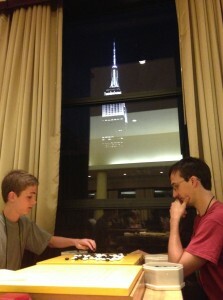 If you follow the AGA on Twitter — @theaga — you’ve already seen Eric Wainwright’s great shot of Ryan Anders 1k playing Cole Pruitt 2D in the 13×13 tournament Sunday night with the Empire State Building glowing behind them. We posted this last night during the tournament; make sure you don’t miss another hot-off-the-press post — many of which we don’t get a chance to use in the EJ — and help us hit 1,000 followers by following us on Twitter and letting other go players know they can get the latest go news here. The US Go Congress includes the largest go tournament of the year and also the smallest. Literally. 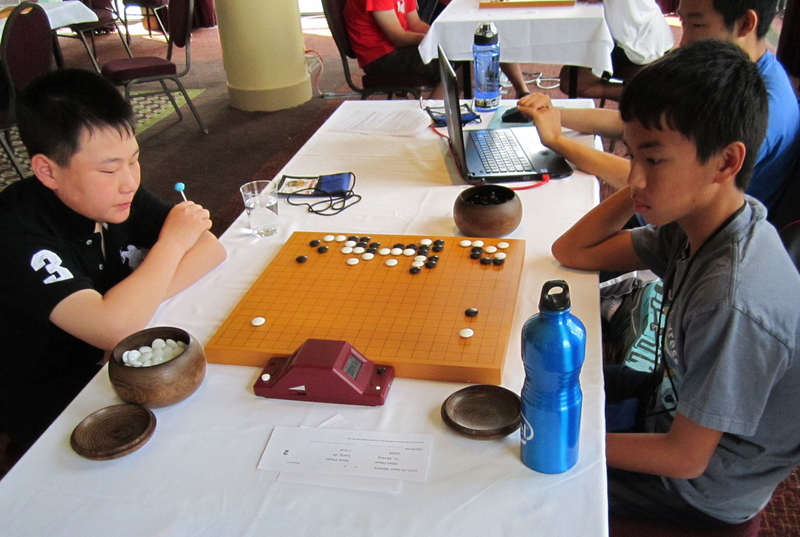 The 9×9 Tournament kicked off right after the Congress opening ceremonies concluded Saturday night. Over 50 players – nine tables with 6 players at each table — battled it out on tiny boards to claim the table winner title and advance to the 9×9 playoffs. Table winners will play off in a single elimination format throughout the week to choose the ultimate 9×9 kyu and dan champions. Joshua Lee directs the tournament. Kyu table winners: Matt Mo 10k; Ann Wu 10k; Bob Crites 8k; Jim Fienup 3k; Ben Peng 1k. The 30th annual US Go Congress kicked off Saturday night atop the historic Hotel Pennsylvania in midtown Manhattan. 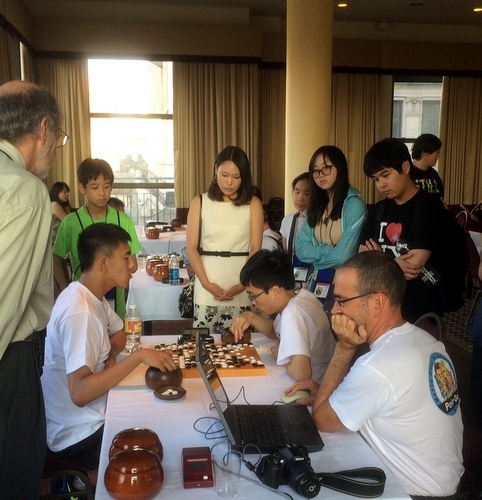 Hundreds of go players gathered on the 18th floor of the venerable hotel to launch the largest annual go event in North America. 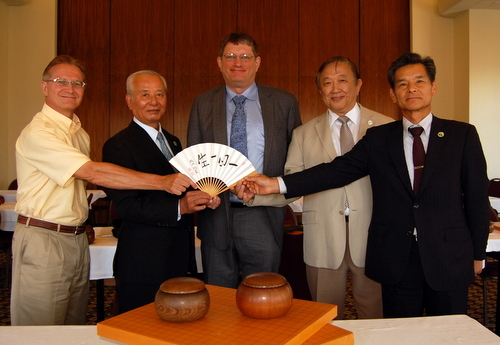 Brief welcoming remarks were provided by Congress Director Matthew Hershberger, American Go Association President Andy Okun (at left in photo), Nihon Kiin Chairman Norio Wada and Asian Go Federation President Suh Daewon. 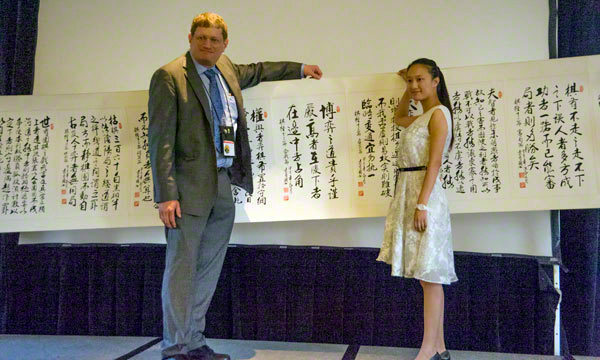 Okun’s remarks were interrupted by the presentation of an impressive 30-foot scroll photo) by Wang Na (at right) from the Qingdao Go Association in China. The scroll, created by 85-year-old artist Yuan Youbin, was drawn from a book called “The Essence of Go.” The keynote speech of the evening was a riveting talk about the future of go by Frank Lantz, Director of the New York University Game Center (look for a report in an upcoming edition of the EJ). Finally, co-directors Will Lockhart and Cole Pruitt showed a well-received trailer for “The Surrounding Game”, their forthcoming documentary about go. 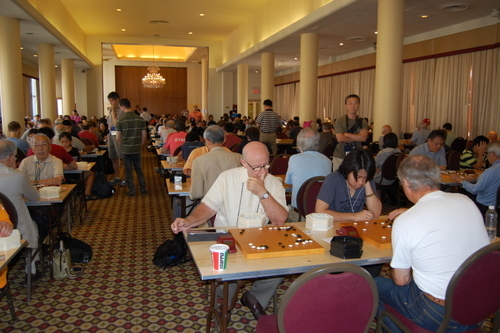 The US Open – which includes Masters Division (formerly the NAMT) – starts at 9a sharp Sunday morning; top-board games will be broadcast live on KGS.